WARS can still be won, even against formidable terrorist organisations. And Sri Lanka shows how. That is the core message of the country's security supremo, Defence Secretary Gotabaya Rajapaksa in a rare interview with The Australian. His office is in the Defence Ministry - his brother, President Mahinda Rajapaksa, holds the title of Defence Minister - a British colonial era building bristling with armed soldiers, alongside a highly fortified military base on a prime location on Colombo's beautiful sandy foreshore. 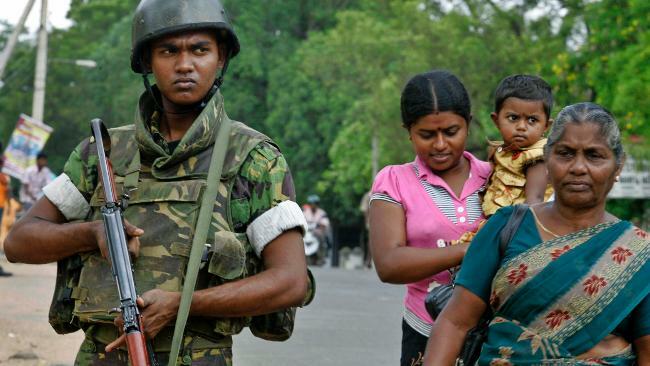 The war may be over, with the leaders of the Tamil Tigers almost all killed following the final assault in May last year, but Rajapaksa is understandably taking no chances having narrowly survived a suicide bombing four years ago in downtown Colombo thanks to his armoured vehicle. Singapore-based terrorism expert Rohan Gunaratna described the Defence Secretary - a 20-year army veteran and former lieutenant-colonel, brought back by his brother from a successful information technology career in California to mastermind the defeat of the Tamil Tigers - as the second most powerful man in Sri Lanka. "If not for him," Gunaratna says, "Sri Lanka would never have won the war", which lasted 26 years, during which time more than 70,000 people died and hundreds of thousands were displaced. Rajapaksa is inevitably a figure of some controversy at home and overseas, characterised - with his brother - as behaving brutally as the war was brought to its bloody conclusion.